That Honda would build a pickup truck should come as no surprise – after all, with motorcycles, ATVs, generators, lawnmowers, weed-whackers and outboard motors making up an important part of the company’s portfolio, their customers need a vehicle to tote these things around in. 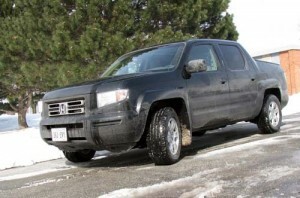 What does surprise, however, is just how well the Ridgeline has been executed. The heart and strength of the Ridgeline is its platform. Gone is the traditional body-on-frame chassis in favour of a unibody with a fully boxed frame built right into it. This platform is incredibly stiff – Honda says the bending rigidity is 2.5 times better than the best body-on-frame compact truck. The upshot is a truck that does not begin to rattle and squeak whenever the body is torqued. Running the Ridgeline through a pretty serious set of moguls on an off-road trek drove the point home. On-road, the stiffness brings the solidity the suspension (front struts and multiple rear links with anti-roll bars at both ends) needs to work effectively. The set up is firm enough to deal with the payloads demanded of a truck (a 705-kilogram maximum), yet it is compliant enough to take the sting out of a rough road. It also means the handling is more accomplished than most trucks – for a workhorse it handles twisty tarmac in a remarkably stable and predictable fashion. The fact the steering has a positive connected feel is the other notable departure from the truck norm – it managed this while wearing P245/65R17 snow tires, which surprised me (when winter roared I appreciated the grip even more). The lone complaint is that the steering effort is a little too high at slow speeds, which gives your upper body quite a workout in tight confines. The Ridgeline is powered by a 3.5L V6 that’s tied to a five-speed automatic transmission. The 247 horsepower and 245 pound-feet of torque delivers strong performance – the run to 100 kilometres an hour takes 8.5 seconds, while the 80-to-120-km/h sprint clocks in at 7.8 seconds –not bad for a 2,059-kg truck. It also brings enough brawn to haul a 2,268-kilogram trailer (when equipped with the towing package), which is enough for most eventualities. The transmission, which includes Honda’s Grade Logic, features a handy lockout for the top two gears. This simple addition means the box does not hunt on long climbs. It is also smooth when shifting and quick to kickdown when the driver hammers the gas. From here the power is relayed to the road through a decent all-wheel drive system and a limited-slip rear differential. The system balances the power demands by acting before unwanted wheelspin is allowed to surface. Under hard acceleration the system drives all four wheels to reduce the risk of wheel spin and torque steer. It then uses the vehicle stability assist (VSA) to shuttle the power left to right and features a lock button. The latter holds the system in its locked 4×4 mode until speeds surpass 30 km/h, which is all that’s needed when off-road (or in deep snow). From an operational standpoint it is smooth and unobtrusive. When it comes to accommodating passengers and cargo the Ridgeline is, again, up to snuff. The full-zoot tester featured leather seating, a decent navigation system, a pleasant audio package and all the power options demanded of a luxury vehicle including a power rear vent window in the back glass. The items that really impress, however, are the seats. Up front there is far more base and backrest bolstering than is usual for a truck. The top of the seat also splays out to provide some welcome shoulder support. The back seat is also above average, as there’s plenty of comfort for a pair of adults and a ton of versatility – there is enough room to store stuff under the seat when it’s in use and it can be lifted up out of the way to maximize interior storage capacity. The ultimate in clever truck design is found in the Ridgeline’s box – an under floor trunk. It is not only capable of holding 8.5 cubic feet of stuff; it does away with the need for one of those unsightly lock boxes that consume precious space. As for the rest of it, the 5-foot box can be accessed by swinging the dual-action tailgate out to the side or by dropping it down in the usual manner. When in the horizontal position the tailgate extends the effective box length enough to carry an all-terrain vehicle (the tailgate is capable of supporting up to 136-kg in the dropped position). The temptation to write the Ridgeline off as a rather soft piece is all too easy. After all, the bulk of the underpinnings started life in the Odyssey. Drive it, though, and the Ridgeline proves it is everything a truck should be and then some. It blends the comfort and appointments of an upscale vehicle with the versatility demanded of a true truck. Fuel economy L/100 km: 14.4 city, 10.1 hwy.